UPDATED: Four links added below the featured article, and another important update was added 4-11-2017. A reader of The Question Evolution Project contacted me about the "big news" that NASA discovered seven new planets that are in what is called the habitable zone. I had not investigated the story very much since these stories tend to be ridiculous: "It's Earth's twin, except it would be like living in lava". I chose to wait for a response from a creationist organization so I didn't have to step in piles of evolutionary dogma and hysteria, and the wait paid off, as you'll see below. 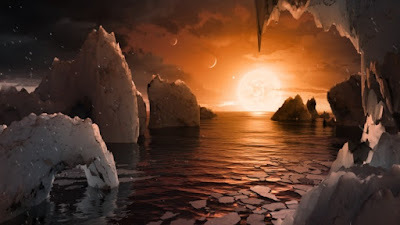 Secularists go daffy over news of possible planets in the habitable zone, and their lapdog press joins in the fun by spreading exciting but actually very fake news. Many speculations, but only a thimbleful of actual science. Why the excitement? So secularists can deny that Earth is a special place that was uniquely created for us. Since abiogenesis (chemical evolution) is impossible, some evolutionists push the problem out into space in hopes that life evolved out there somewhere, and found its way here. 7 earth-like planets that could sustain alien life discovered. And today California granted them drivers licenses. If a planet is in the habitable zone, it means that it's not too hot, not too cold, just right for maybe perhaps could be water on it. And according to the fake news, if there's water, then life could evolve there, God the Creator need not apply. This child knows that there's a passel of information that needs to be examined before going into woohoo conjecture land. Secular scientists are excited about the recent detection of seven Earth-size planets in the constellation Aquarius, a nearby solar system. According to the report, three of the planets orbit a parent star, called TRAPPIST-1, at a distance that would allow water to exist on their surface. Many evolutionists are giddy with the suggestion that life on one or more of these planets is just around the corner. But this wholly unwarranted extrapolation lies far beyond the known facts. Just because a planet may be positioned for surface water to exist doesn't mean water is there. Even if liquid water is present does not mean complex organic life is even remotely possible. To read the rest, click on "Seven Earth-size Planets Discovered". EDIT: For another article on this subject, see "Discovery of 7 Earth-Sized Planets Orbiting Star TRAPPIST-1". EDIT 2: Also, "Ultracool Trappist-1 and its seven planets". EDIT 3: The first two segments of Dr. Mohler's podcast The Briefing are relevant here. EDIT 4: The planets are not in the "habitable zone". How Old are the Hawaiian Islands? Where Did All the Floodwaters Go?